Windows services are executable applications that run in background. They are controlled by Service Control Manager(SCM). They can be started, paused, re-started manually. A service can run without any user being logged on to the computer. Typically, Windows services start when the Microsoft Windows operating system is booted and runs in the background as long as Windows is running. These features make services ideal for use whenever you need long-running functionality that does not interfere with other users who are working on the same computer. Two classes are required for implementing window services. This method is called by Service Control Manager when your service is started. This method is called by Service control manager when your service is stopped. This method is called when your service is paused. This method is called when your service resumes after being paused. This method is called when the system is shutting down. This is a Boolean property. States whether the service should write to the event or log on common events such as Install and Start. Set true if service is allowed to log entry. This is a Boolean property. It is set to true if the service should be notified of a change in the power status of the system on which the service is being executed. This is set to true if your service need to handle Session change. This is a boolean property that is true if the service can be paused and then restarted, false otherwise. This is a boolean property that is true if the service wants to be notified that the system on which it is being executed is being shutdown, false otherwise. This is a boolean property that is true if the service can be stopped, false otherwise. The Installer Class provides the foundation for custom installations. This is the base class for all custom installers in .NET framework. It helps install applications on a computer. 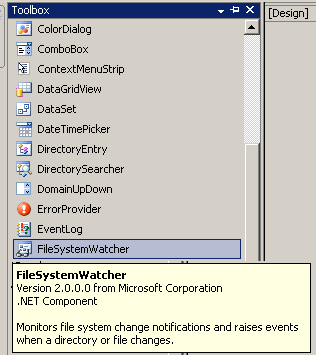 When this service is started, it monitors a Folder constantly whose path is specified in app.config file. This service writes an entry to a file whenever any file or folder is created, deleted or renamed. To create a new windows service project open Visual studio and Click File menu ->New -> Project and select Visual C#-> Windows -> Windows Service Project type. 1. Click designer to select service1.cs. 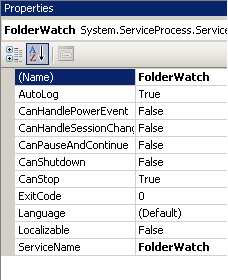 (press F4) Then in properties window change the ServiceName and Name property to FolderWatch. 2. Set AutoLog property to True. 3. 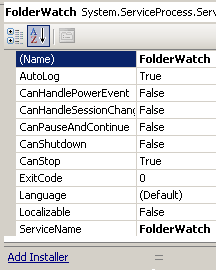 Open program.cs and edit the Main method to create an instance of FolderWatch. 3. Open Service.cs to implement OnStart() and OnStop() methods. These methods are automatically overridden when you created the project. You can also override other methods like OnContinue(), OnPause() and OnShutdown(). 4. Open service1.cs in design mode and from Toolbox select FileSystemWatcher control and set its name property to FolderWatcherTest. 5. Go to FileSystemWatcher control's properties and give the path of folder which needs to be monitered. Or you can set this path in app.config file of your project and specify this app.config path in OnStart event of your service. 6. The FileSystemWatcher provides following events to be handled. 7. These events are implemented in service1.cs class as shown below. Here whenever any Folder/File is created, deleted or renamed it writes an entry in a file using a Textwriter object. 8. When installing windows service some custom actions need to be performed which can be done with help of Installer Class. Visual studio creates these installers for a window service and adds them to your project. 1. 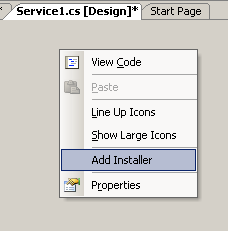 Go to Service1.cs in designer mode .Right click and click Add Installers to add Installer Class. 1. Go to Properties of Service1.cs class. Click the Add Installer link. 2. When you click Add Installer visual studio adds two components to your ProjectInstaller.cs class. This is the installer for your serviceâ€™s associated process. This is the installer for your service. LocalService: Service presents the computer's credentials to remote servers. LocalSystem: Service presents anonymous credentials to remote servers. NetworkService: Service has limited local privileges and presents the computer's credentials to remote servers. User: A local or network account is specified. You may specify the necessary username and password via properties, or you may type them during installation. The Service uses the security context of the specified user account. Following three options are provided to specify how your service is started. Manual :- The user starts the service. Automatic :- The service starts automatically when the system starts. Disabled :- The service is not available for use. 3. Go to Properties of serviceInstaller1 class and set ServiceName to FolderWatch and StartType to Automatic. 4. Go to Properties of serviceProcessInstaller1 and set Account property to LocalService. This causes the service to run on local service account. 1. Right click your project in solution explorer and click properties. 3. Build your service from Build Menu and select Build FolderWatchService. Or press Ctrl+Shift+B. 1. Open Visual studio command prompt utility from Start->Programs. 2. Go to the Folder where your projectâ€™s executable (.exe) is present. 4. To Verify that your service is installed go to Run and type services.msc. press Enter. Find your service in services list. Instead of manually installing your service you can create a set up and deployement project for your service and create a .MSI package and install your service by running your .msi file. This tutorial is written by DotNetFreaky.